It could only happen in Norway: a hiker traveling a historic route found a 1,200 year old Viking sword in excellent shape. The sword is in such good condition it could be used today. Photo: Hordaland Country Council. The sword was found at Haukeli in central southern Norway and it will be sent to The University Museum of Bergen for conservation – not that it needs any. Jostein Aksdal, an archeologist with Hordaland County said the sword was in such good condition that with a polish, it could still be used today. “The sword was found in very good condition. It is very special to get into a sword that is merely lacking its grip,” he said. “When the snow has gone in spring, we will check the place where the sword was found. If we find several objects, or a tomb, perhaps we can find the story behind the sword,” he said. 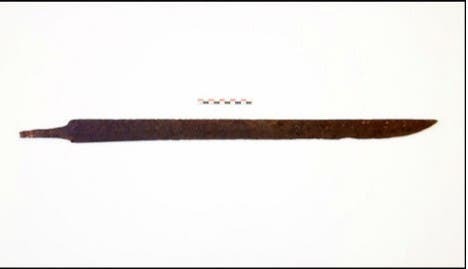 Judging by its size and appearance, the swords seems to be dating from approximately 750-800, although more precise dating will be undertaken at Bergen. The sword likely belonged to a smaller lord or village leader and was used to symbolize strength and richness. “This was a common sword in Western Norway. But it was a costly weapon, and the owner must have used it to show power,” he said.